The era of fast cars is, surely, over. Traffic jams, speed cameras, environmental concerns, enhanced policing – all are good reasons to be passengers in a Prius, rather than at the wheel of a ripsnorting, overpowered machine. And yet: human indulgence is about wants rather than needs, and sales of performance cars, from Ferraris and Porsches to Mercedes AMGs, have never been higher. Here are six reasons why you should turn your back on the politically correct, gender-neutral advocates of no-car ownership and buy LUX’s current wheels, the Mercedes-AMG C 63 Estate. High performance means the best technology goes into brakes, tyres, wheels and suspension to keep the car on the road in the event of an upset. If a car has the capability to travel 186mph (as ours does), you can bet you feel safer driving around a corner at 40mph than you would in a Prius that maxes out at 90mph. AMG is a former independent race tuner that Mercedes liked so much, it bought it, Remington-style, at the turn of the century. The division still operates quasi-independently, from its own factory, and is completely unlike the racily-badged marketing pieces that crop up from other car companies. AMG rips out the suspension of standard Mercs and replaces it with its own technology, which manages to be both supple and sporting. It may be that, one day, it is as acceptable to say you enjoy driving as it is to admit you voted for Donald Trump. But for now, taking a car that is tuned to be driven, rather than mass-produced as an people-moving algorithm, onto empty and exciting roads is a thrilling experience. And the sound of its V8 engine, 6.2 litres driving what is still a ‘compact saloon’, should be bottled. 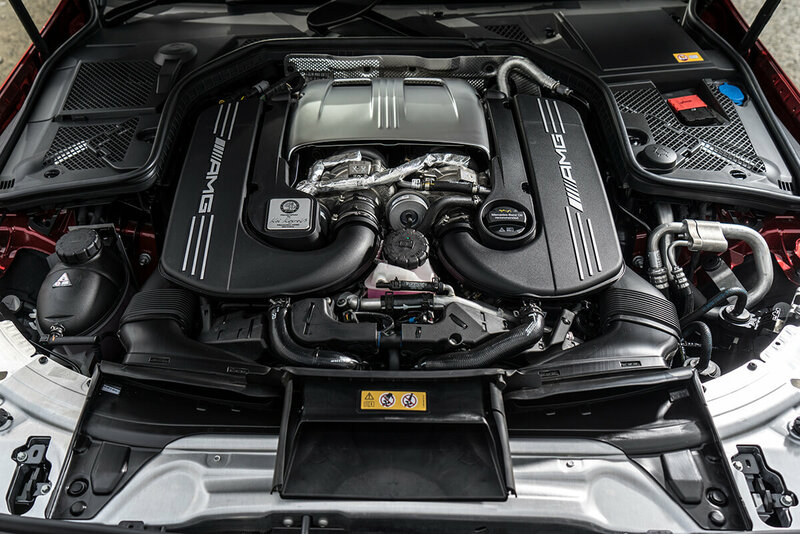 The latest version, shown in our pictures here, has an even more powerful V8 engine with two turbos (because one is just not enough). 4. You can race it. It would be very odd to take a family estate/ wagon onto a racetrack. But that’s where the C 63 AMG was honed. We did it once, and hearing the engine roar, to a consistency and volubility that is just not feasible on the road, and feeling it grip and move in the corners, was a life-changing experience. In the nicest possible way. It might go from zero to sixty faster than a space rocket, but this is otherwise the same car that can fit surfboards, cases of Pétrus, your latest Richter in its plywood case, and your four best friends, into its insides and express you across the continent. Do excuse us if we didn’t make this explicit: but this car, while looking like a solid family sedan, can run rings around Porsches and overconfident giant 4 x 4s. There’s nothing quite like hearing its engine rise in tone as everything gets smaller in your mirrors.